With the increase in popularity of the "Speed Bag" rather than the "Singlet Bag" for grocery packing, we have had several requests for a suitable frame. 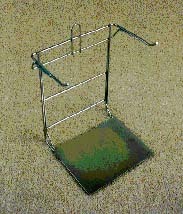 As a result, we now produce the stand, shown above left which is a heavy wire frame with a double back support and has reinforced arms to hold the bag top. It has a steel plate as a base and is chrome plated. It can be free standing on the checkout, screwed through the base to hold it in place or, using the mounting brackets (XE/046), it can be height adjusted to suit different checkers. 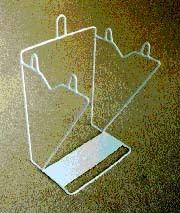 For customers who still have a requirement for the Singlet Bag Stands, we continue to produce that type in the two sized shown below. to suit large bags as used in supermarkets.